Access NFPA 3000™(PS) with an online subscription. Gain confidence in your ability to protect the public though coordinated planning and response. 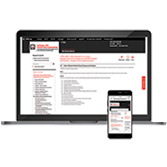 Improve first responder and community preparedness for active shooter and/or hostile events with a 1-year or 3-year online subscription to NFPA 3000™(PS), Standard for an Active Shooter/Hostile Event Response (ASHER) Program. The first comprehensive multidisciplinary program addressing active shooter and other hostile events was created with widespread support. NFPA® worked alongside fire service, law enforcement, EMS, emergency management, higher education, and facility management professionals to develop this landmark document. Committee members include representatives from more than a dozen agencies and associations such as the U.S. Department of Justice, Federal Bureau of Investigation, Department of Homeland Security, International Association of Chiefs of Police, and International Association of Fire Chiefs. A 1-year or 3-year online subscription lets you reference NFPA 3000™ (PS) from your laptop or phone -- anytime*. Access NFPA 3000™ (PS) 24/7 online via your laptop, PC, or mobile device. Instantly search the document and create bookmarks for frequently needed information. Create NFPA 3000™ (PS) document citations to include in reports, proposals, and presentations. Access the latest NFPA 3000™ (PS) content if a tentative interim amendment (TIA) or errata is issued. Receive any updated edition of the standard issued during the term of your subscription. Subscribe now to improve your training, planning, and peace of mind. There's no substitute for this important new document. An online subscription to NFPA 3000™ (PS) is essential for safety planners, first responders, and policy makers such as School Superintendents, Facility Managers, Building Owners, Safety Officers, Security Consultants, Loss Control/Risk Safety Managers, Emergency Services Directors, Human Resources, Fire, EMS, Police, and Federal, State, City and Municipal government officials, as well as others responsible for emergency response and public safety.